This movie is sure to keep the political controversy fires surrounding Benghazi aflame. The trailer shows these six men being called to action – not by an order or duty, but by morality. They are the only ones who can help, and so they do. The U.S. compound in Libya is attacked and the ambassador killed. These men stand together to defend it. 13 Hours is written by Chuck Hogan (The Strain), and stars Pablo Schreiber (Orange Is the New Black), John Krasinski (The Office), Toby Stephens (Black Sails), David Denman (Parenthood), Max Martini (Crisis, Revenge), James Badge Dale (World War Z), David Costabile (Suits), Dominic Fumusa (Nurse Jackie), and Demetrius Grosse (Justified). 13 HOURS sets the record straight on what happened during a night that has been shrouded in mystery and controversy. Written by New York Times bestselling author Mitchell Zuckoff, this riveting book takes readers into the action-packed story of heroes who laid their lives on the line for one another, for their countrymen, and for their country. 13 HOURS is a stunning, eye-opening, and intense book–but most importantly, it is the truth. The story of what happened to these men–and what they accomplished–is unforgettable. 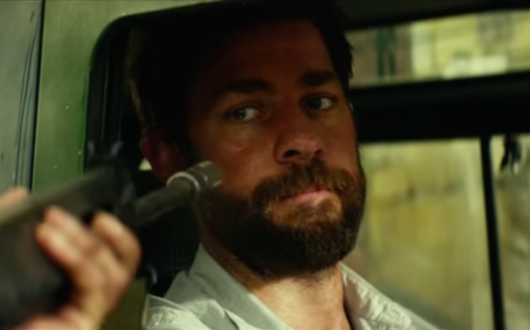 From Michael Bay comes 13 Hours: The Secret Soldiers of Benghazi. Watch the official trailer, in theaters January 15th.